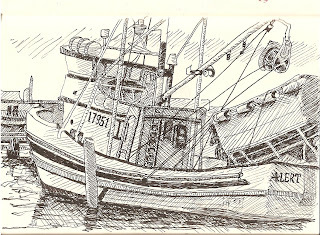 This was one of the seemingly hundreds of fishing boats docked at Fisherman's Terminal in Seattle Washington on a recent sketching trip with a couple of artist friends. Hope to go there again soon. Thanks, Dave. Loved your motorboat marina drawing too. Drawing from a kayak sounds really fun. Sorry I won't be able to make it to your invitation to draw on Thursday. Another time, Yes! Love your ability to play between light and shadow! Beautiful work, as always! Great vignette of one of the seemingly hundreds of boats; I've always been overwhelmed trying to draw boats (and they keep moving!). The contrast adds a lot of life -- nice and sharp.